I have never been a high achiever. Until I started writing (thanks to Penny Dreadful, Solomon Smee and Maisie Morris), the only two things I had won were a Toners hair dye from Jackie magazine in 1982 and the umbrella and yoghurt pot race in the St Mary’s primary annual sports day (the other “races” including “eat a doughnut hanging from a string without using your hands”. This was pre Jamie Oliver, obviously). It wasn’t through lack of trying, just that perseverance and determination still only ever got me second place. But now, at the age of *mumbles*, I am finally attempting to get my name in the record books, quite literally. 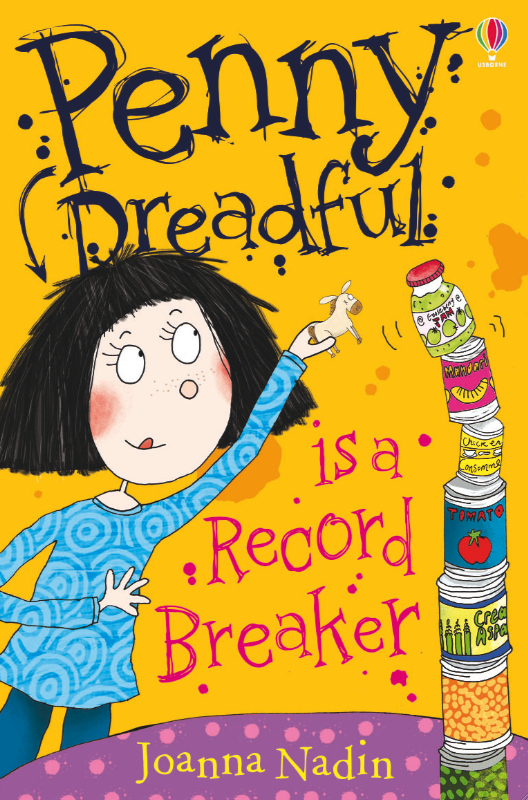 As, to mark World Book Day, and the release of Penny Dreadful is a Record Breaker, I will be attempting to conduct the world’s biggest ever literacy lesson and win a Guinness World Record. And, while I am not sure the process will be quite as bonkers as Penny’s attempts at standing on leg for the longest time ever, or building the highest ever tower out of some soup tins and a plastic horse, I do know it will be exciting. This entry was posted in Blog, Reading and tagged Bath, Guinness World Record, Joanna Nadin, Penny Dreadful, Usborne. Bookmark the permalink. Wishing you lots of success on World Book Day!